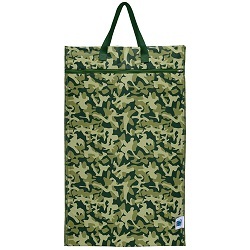 This lightweight wet bag measures approximately 16.5" x 27" and can hold 2 days worth of diapers. 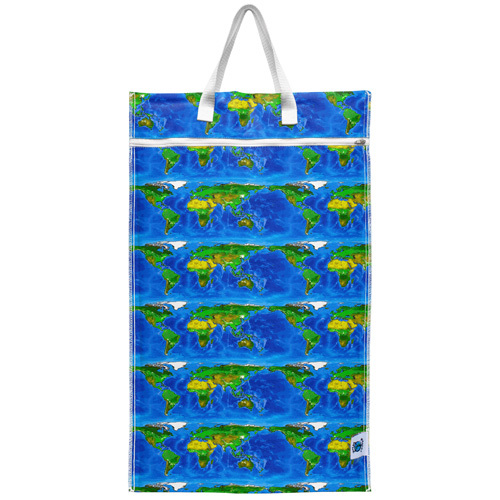 Planet Wise Lite Hanging Wet Bag - Perfect for Home and Nursery! 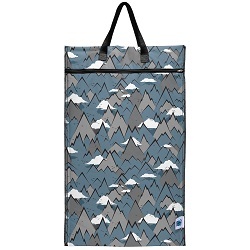 The Planet Wise Lite Hanging Wet Bag is a great wet bag for dirty diaper storage at home. Constructed of a single layer of PUL, you can find this wet bag in some of the same fun prints as Best Bottoms Diapers. Two durable nylon hang straps allows the bag to hang on any hook or doorknob, while the lead-free zipper closure helps contain stink. The Planet Wise Lite Hanging Wet Bag can hold 2 days worth of cloth diapers and is a great addition to any home or nursery. 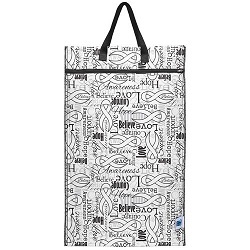 Measures approximately 16.5" x 27"
Looking for similar features in a smaller bag? Check out the Planet Wise Lite Bag, perfect for outings and on the go. Store clean cloth diapers in your wet bag! That's right, separate pouches seal away soiled cloth diapers from fresh diapers in the Planet Wise Hanging Wet/Dry Bags. I love it! It holds 2-3 days worth of our diapers! It's much larger than I thought it would be, too. I just hang it on the door and grab it when it's full! Definitely recommend! 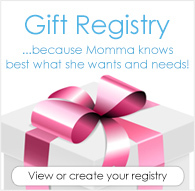 And great beyond diapering for just regular laundry, too! I love these hanging wet bags. I have several of them now. They are thick and well made, and convenient to use. They are a great deal for the price! This is our favorite wet bag. It does what it needs to do -- contains smells and wetness -- and is so light that it dries in half the time as our other hanging wet bags and is very easy to transport. Pretty sturdy and decently sized. It holds more than 2 days worth of diapers for me.